May 1 How to Make Forsythia Syrup: A Golden Springtime Delight! There are a few beautiful harbingers of Spring, but the sunny yellow blossoms of the forsythia are my absolute favorite! When those happy blooms start showing their faces, it just makes the whole world brighter....Spring is on the way! But did you know forsythia as a medicinal herb is actually very useful? And that the flower is edible? I made some golden forsythia syrup to use in recipes, and here are the super easy directions! But first: A bit of useful information about forsythia. If you just want the recipe, scroll down to the bottom, and you'll see the easy steps! We first saw our new homestead when it was still blanketed in snow (3/2018). We moved in just a month and a half later (4/2018), and what a big difference in the plants! I had no idea that this dormant and rather large shrubby tree would bloom so beautifully. I discovered it was a large Forsythia plant, and I was intrigued by its joyful nature. Forsythia is a lovely plant that is covered in bright sunshiny flowers in the early spring. It can be a small shrub or a large scrubby tree. It needs to be pruned after it has flowered completely to maintain a less spindly look. The flowers grow on the older twigs and less so on the new growth of the season. 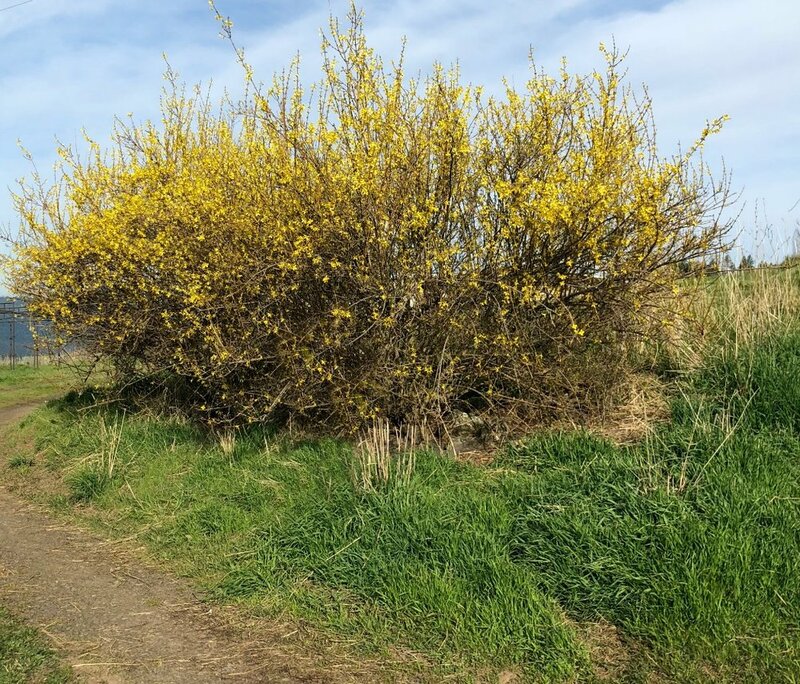 There are around eleven varieties of forsythia, and although they all contain valuable chemical constituents, it's the Forsythia suspensa, which is a "weeping" species, that is one of the 50 Fundamental Herbs in TCM (Traditional Chinese Medicine). One of the cool things I have discovered about forsythia is that you can bring the branches inside, place them in a vase of water, and watch them bloom for a very long time! In fact, when I stripped the flowers off the stems for this forsythia syrup recipe I'm going to share with you in a second, I couldn't bear to compost the stems, as I could see green growth on them. I placed these in a Mason jar vase....and enjoyed new blooms in my kitchen! Here is Forsythia. This is actually two large "trees" that really look like large shrubs---I'll be pruning them after the flowers die off. What is Forsythia Used For in the Herbal World? Forsythia is quite an interesting plant. The species used medicinally is Forsythia suspensa, and it happens to be a relative of the olive tree. Like the olive tree, it flowers first, then produces a fruit. This fruit, along with the bark, is what is used medicinally. There are other species of forsythia, and they all contain pinoresinol, which is a plant lignan. It's a great antioxidant for the body! The fruit is useful for skin conditions and is often included with other spring flowers, such as honeysuckle and dandelion. You can be sure I'll be making a great salve very soon! When the fruit is decocted, it can help alleviate nausea and vomiting, and is useful for flu. It also may help with heart conditions, as it supports the body in maintaining healthy blood pressure. I'll definitely be adding this to my arsenal for natural heart preventives! NOTE: If you are interested in learning more about botany and wildcrafting the plants in your area, take a look at this Botany & Wildcrafting Course from the Herbal Academy! Here is a close up view. The flowers look fragile, but in reality, they are strong little things. The branches, as you can see, are "twiggy." Did you know that forsythia has been an important plant used in some spiritual ceremonies of old? In fact, some believe placing a few sprigs of forsythia in a Mason jar of water will bring love to you as the flowers bloom. There's even a legend from Korea about how a man left his wife. When he returned, he found her waiting for him by the forsythia bush. He was so enthralled with her loveliness, he never left her again. So...what are the forsythia flowers useful for? How about making some golden Forsythia syrup to use in recipes and even on your pancakes? And are you wondering what forsythia syrup tastes like? Well, it's got a slight hint of honey flavor that is like the mild scent of the forsythia flowers. It's really pleasant. And I LOVE the color. It's golden and very pretty. I just cut about six or seven sprigs of Forsythia about two feet long. I then plucked the flowers from them. The reason I didn't decide to stand by the plant and pluck the flowers is that there were yellow jackets buzzing around my head, and honestly....I wanted to scream like a little girl. I felt bad about "wasting" the sprigs, so I put them in water and was rewarded with lots of new blooms over the next few days! This is about three cups of flowers. I boiled about four cups of water and poured it over the flowers. Then I steeped it overnight (covered) for a nice strong tea. Forsythia syrup is really a simple syrup---SO easy. Pour about three cups of the Forsythia tea into a pan, and add three cups of organic sugar. Simmer until the sugar is completely dissolved. Cool down and bottle it up! I used a quart Mason jar, and this recipe yielded a full Mason jar of syrup, plus this little extra glassful. Here's my little leftover cup of Golden Forsythia Syrup. I don't drink hard alcohol as a general rule, but I do use Vodka in my herbal tinctures. 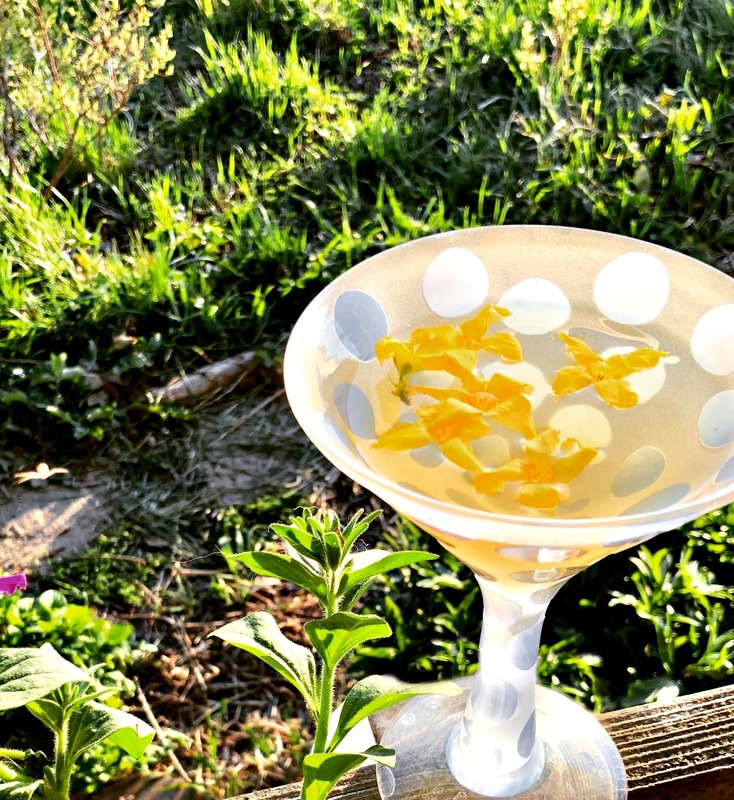 I decided to make a "tini" from the forsythia syrup, just to experiment. What an absolute joy this plant is! You can't help but be happy when you see the bright yellow blooms out your window! I'll be attempting to root some more of this plant, you can be sure. I'd like to have it growing in a few more places around here! I feel very blessed by this unexpected treasure in our new home. If you have forsythia around your area, I hope you'll give this syrup a try! You won't be disappointed---NOTE: If you do, though, be sure it's not growing in an area that's been sprayed. You can find out more about the Safety Basics of Foraging and Wildcrafting in this article. There’s lots more over on the blog too! So head over and explore! I'd love to know what you think, so please leave comments in the comments section. P.S. If you haven't done so yet, I hope you'll sign up for our newsletter! You'll never miss a thing, and you’ll get immediate access to the Free Resource Library! You’ll love what’s inside! P.P.S. Don't forget about the Wildcrafting and Botany class from the Herbal Academy of New England. It's online, and you can start and end when you like. I just signed up too! P.P.P.S. You may also be interested in these heart-related articles: 8 Easy Things to Do Every Day for Heart Health and 8 Powerful Herbs for Your Heart. I am NOT a medical doctor or professional. The statements made here are for informational purposes only. Please do your own research and speak with your medical doctor before using any herbs or essential oils. In no manner, stated or implied, is any statement made by me meant to diagnose, treat, prevent, or cure any disease. These statements have not been evaluated by the FDA. Find out how to make forsythia syrup in three easy steps! Also, what is forsythia, and how is it useful to us? Forsythia is a pretty fascinating plant, it turns out, besides being beautiful. So, here are directions for you to make this simple herbal syrup using forsythia. May 1 Natural, Easy Ways to Detoxify Your Body This Spring: Clean Out, Clear Out, and Feel Great!